Nothing compares to the Maryland tradition of a bucket of steamed Blue Crabs coated in a zesty layer of Old Bay seasoning. Add an ice-cold National Bohemian beer and you’ve got the authentic Maryland experience. Whether cooking for a large group or providing dinner for an intimate family gathering, follow our Blue Crab cooking guide to create the ultimate Southern Maryland seafood spread this summer. Crabbing in Maryland is prevalent, and you will find people selling Blue Crabs at most docks and fish markets. Crabs purchased straight from the dock or from a seafood market are generally put into three categories based on size. Large males measuring over 6 inches across make up the Number One group. These crabs typically have the most meat and provide the best eating. In Number Two, buyers find smaller, less meaty male Blue Crabs. The Number Threes are the ungraded, smallest crabs. This group is mostly females with a few smaller males. When prepping for your Blue Crab feast, avoid going with the cheapest crabs available. 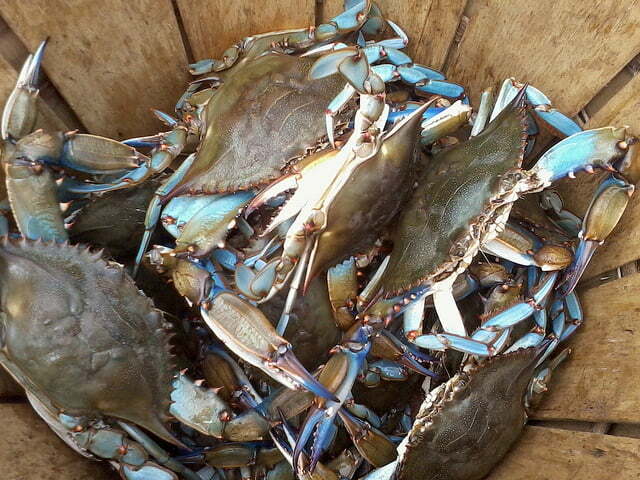 Although tempting, these have less meat and will lack the rich Blue Crab flavor. If you are feeling particularly adventurous, try some recreational crabbing with the family to catch your own dinner! When purchasing, look for crabs that are close to molting. These crabs will have pink or rust-colored edges on legs and shell. Steer clear of the white shells that signal molting has already occurred. These crabs contain more water in their bodies, while the unmolted crabs are fatter and full of flavorful meat. If you have trouble telling the molted crabs from the unmolted crabs, ask the salesperson for “fat” or “heavy” Blue Crabs. While you can buy Blue Crabs all along the coast from Nova Scotia to the Gulf of Mexico, the Chesapeake Bay is widely regarded as the best place to get Blue Crabs. With the largest population, the Chesapeake Bay coastline in Maryland provides residents with the best market prices and quality selection of Blue Crabs. Male Blue Crabs, referred to as “Jimmies,” are larger and meatier than the mature females, called “Sooks.” Blue Crab enthusiasts prefer the Jimmies for eating whole, as they offer richer, more plentiful meat. Crabbing professionals normally sell unwanted Sooks to processing plants that package fresh or pasteurized meat for commercial sale. Although buying less expensive Sooks may be tempting, splurge when preparing your crab feast and get the Jimmies. You won’t regret it! To prepare Blue Crabs like native Marylanders, steam crabs instead of boiling. This helps the meat stay light and fluffy instead of becoming waterlogged. Although some swear by plain water for steaming, most Maryland residents use equal parts light beer and apple cider vinegar. Some chefs even use white wine in place of beer. A spice mix using ingredients like nutmeg, cumin, celery salt, dry mustard, and black pepper is added to the liquid, stirred, and then brought to a boil. Do not be afraid to experiment with your favorite spices to invent a custom blend. If this is your first time steaming crab and you have reservations about improvising, using store-bought spices like Old Bay is perfectly acceptable. Follow the recipe provided below to try your hand at steaming the perfect Southern Maryland Blue Crabs. Keep crabs cool and moist until ready to cook. If you don’t own a steamer, use a large, sturdy pot with a basket or some sort of shelf that keeps the crabs from hitting the liquid. Submerging the crabs causes them to become soggy and less appetizing. While some use only salted water to steam the crabs, the true Marylander way is equal parts light beer and apple cider vinegar. Fill the pot about 2 to 3 inches deep with liquid. (The basket should sit at least 2 inches above the liquid.) Salt and spice liquid generously, and then bring to a rolling boil. After liquid mix reaches a boil, you can start adding the Blue Crabs into the steaming basket. Use tongs for handling the live crabs, as they can get pinchy. Layer 3–4 crabs at a time and then add a thick coat of seasoning. You can cook several layers of crabs simultaneously as long as there is room for the lid to close. Cook Blue Crabs until they are a burnt reddish-orange color and there are no green or blue spots left (about 20–30 minutes). Check crabs every 10 minutes to ensure they do not get overcooked.Once you remove crabs from the pot, allow the liquid to return to a boil before starting with the next batch. Cover cooked crabs with more seasoning, if desired. Keep the eating area clean by covering the table with layers of newspaper or brown butcher’s paper. Put out bowls of white vinegar or melted butter for dipping crabmeat. You can add garlic, jalapeno, or chilies to the vinegar to bring extra flavor to crabs. While some people use wooden mallets to open shells, you can use your hands to break open the shells fairly easily. Although Blue Crabs can be purchased year round, summer is peak season for getting the biggest and tastiest crabs. Try out this recipe to enjoy your summer in authentic Southern Maryland fashion with a bushel of perfectly cooked Blue Crabs.